A kitchen backsplash can really add up in a kitchen project budget. 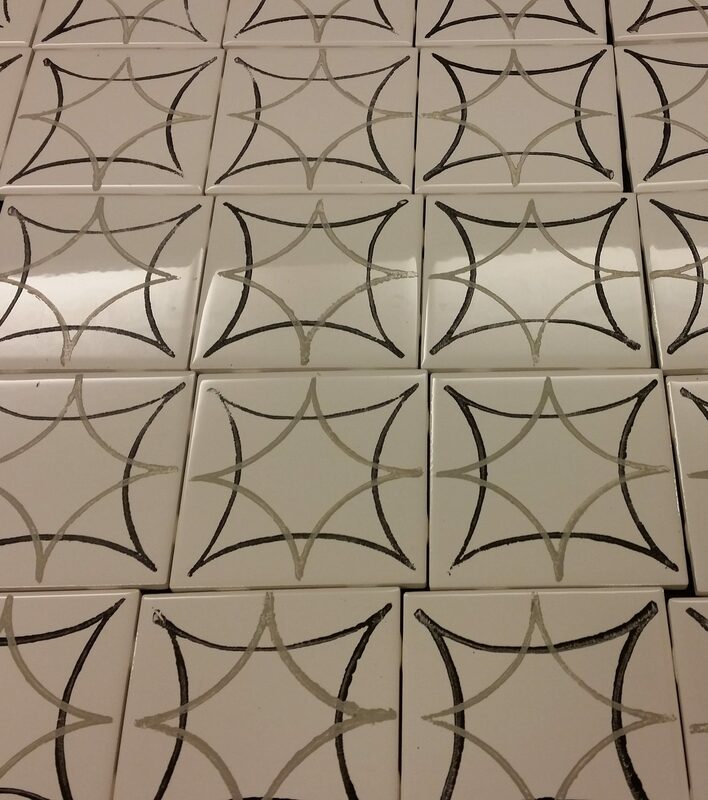 When I was researching for tiles for my kitchen backsplash I completely fell in love with the cement tile backsplash. The problem was: They are Oh! so pricey! 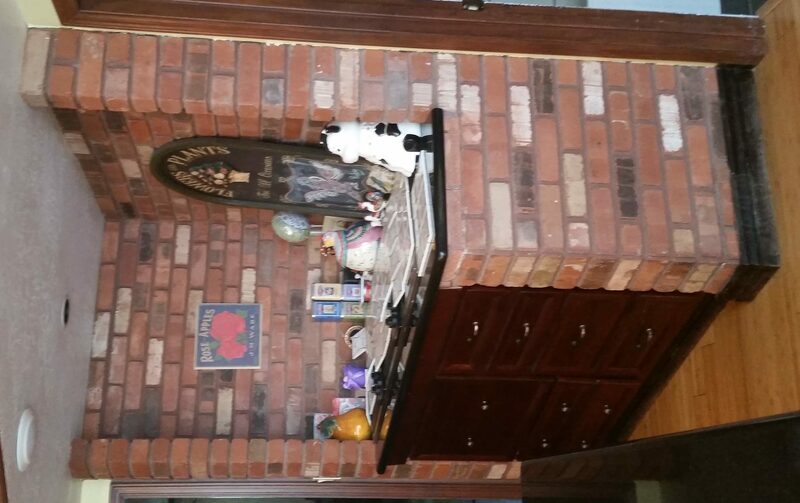 According to my measurements for the wall behind my stove, I would need $900 worth of cement tiles. For one wall!! (See my kitchen project here). And, that’s not counting the thin set, grout and the sealant. Worse? I had two walls of about the same size to do. 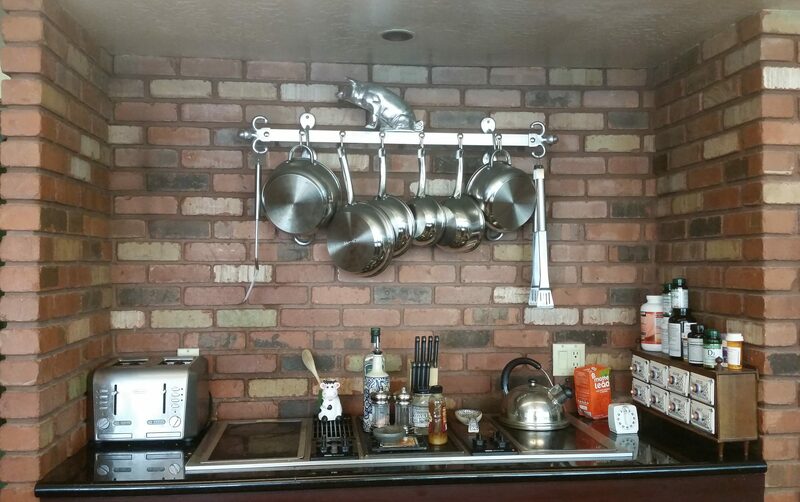 $1800 for a backsplash? I don’t think so! If you do have the money and don’t want to get into stamping, check these designs I found on Amazon (below). They are mah-velous! I decided to research some more to see what was out there as a possible alternative to make a faux cement tile backsplash. 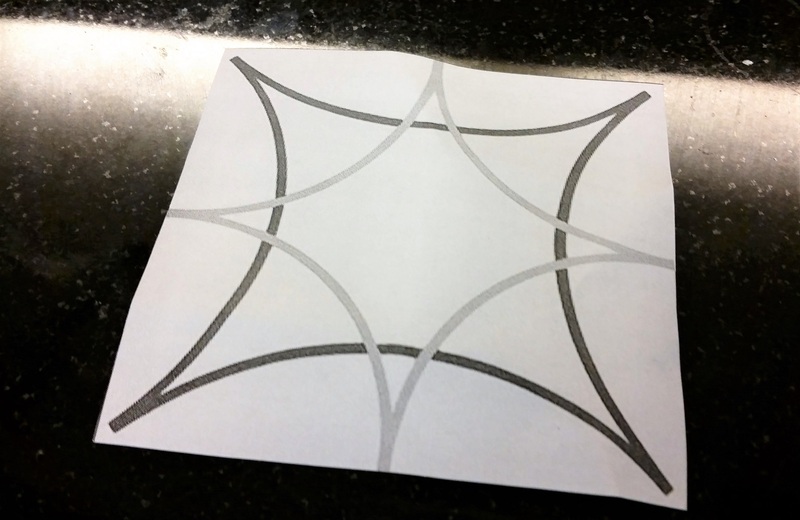 However, most DIY projects for cement tiles involved using stencils. While I love stencil projects (like my DIY Bar Menu and my Bar Sign projects), I felt that this one would have to be a little easier since I still needed to get tiles installed first before I could get into the printing process. I decided that stamping would be a lot faster and easier because if you are following a print on a stencil you can’t really move on to the next piece until the other piece next to it dries. Especially if you already have the tiles installed and you just want to update it. It doesn’t look like much now but wait until you see all the tiles side by side. The effect is really cool. Click on the link to see my tutorial on how to create a stamp for this project. Once your stamp is ready. It’s time to stamp away! The top stamp goes with the black design and the bottom stamp is for the gray design. Sealer (Be sure that your paint base is the same as your sealer-Water based paint/water based sealer. Or oil based paint with oil based sealer). Watch for sealers that can yellow the paint.The yellow could ruin your final color). Finally, if you don’t want it too shiny I would select satin finish instead of gloss. Now, you ask: “why would you go through all the trouble to tile the wall and paint the tile when you can buy a ready-made tile backsplash with all the colors you want?” Price! Since I wanted the look of cement tile and their prices were prohibitive for my I had to find another option. Sure I could have bought these fancy looking backsplashes you see everywhere. But they would not look right in my kitchen and they are still pretty pricey. The option was to get these square subway tiles at Home Depot. They were pretty cheap and for one wall I spent about $38 bucks! The total cost for both my walls with all materials was less than $100 (tiles and stamp materials included!). If you already have the tiles and all you are doing is the stamping, you are looking at less than $25 bucks for the stamp materials, the paint, and the sealer. 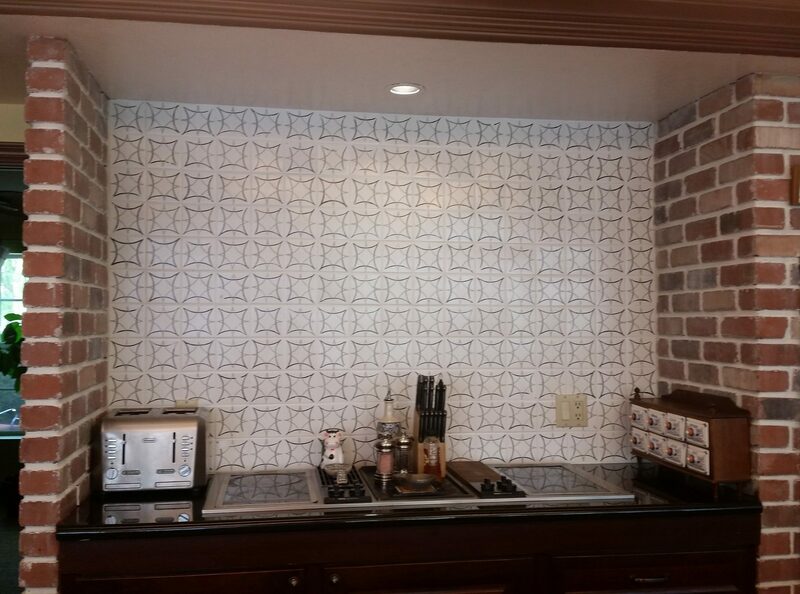 Not bad for a customized backsplash! See why I took that route? I will not be teaching you how to tile here today (hopefully soon). But I will show you how to stamp these tiles and get them to look exactly how you dreamed. Note: If you are starting your project with a tiled wall with a base color or print you don’t like simply apply the primer, paint the tiles with a new base color and then start your stamping project. Important Secrets for your tiles to last (don’t Skip! Since I was going to have to tile the walls I decided to stamp the tiles BEFORE installing them. My honest opinion? DON’T! After installation, I had to grout the tiles. That’s when you risk losing your work. Even if you apply all the seal in the world, the print will not survive the grouting process. Grout contains sand. Even if you use unsanded grout, it will still have some “grit” to it and it will peel the paint right off. So if you are starting with new tiles like me, please tile first, then grout, THEN stamp. If you are concerned whether the paint will hold the normal wear and tear of a kitchen, it will. You will need to be a little more careful not to scrub the tiles too heavily when cleaning, but once the seal sets, it will hold just fine. After the tile is installed, you will need to apply the primer. Simply use a foam roller or brush. Apply a couple of coats just to be sure. Let it dry well between coats. Once the primer (or base paint) is dry (preferably overnight) then you can start the printing process. You can do some test pieces first to get a hand of the technique before doing the entire wall. I started with my darker color stamp first. The easiest way to do it, in my opinion, is to get a shallow tray for the paint and grab just a little bit of paint with a foam roller and roll it onto the stamp. Be sure to take out the excess paint from the stamp with a foam brush. You really want just a little bit of paint and just enough to cover the raised design on the stamp. Since I used a tile with the same size as the tiles I was printing, all I did was line up the sides of the tile to make sure my print was centered and applied just enough pressure to transfer the paint from the stamp onto the tile. Notice the imperfections? Don’t worry! If you researched about cement tiles you probably know that they are hand made and that each one is unique. And yes, the imperfections ARE part of the real deal and it will be part of our project here too. Pfeeew! But I wanted something close to the real deal, so the imperfections stay! Now if you make a big mistake like a misaligned print or the print is too light, no worries. Simply wipe the design off and start over! The next step was to stamp the lighter color over the black design. Same process as the stamping above. I lined up the base of my stamp with the sides of the tile and the print was automatically centered. This part was fun because the paint dries quickly and you can actually start the second color just about an hour after the first color. Since I had over 100 tiles to print (I lost count), by the time I finished the first color on all tiles, the first tile was dry enough to start the second color. The whole wall (er, tiles for that wall) was done in about 2 hours! It was very cool to see how they looked so quickly. See the final effect with the circles and squares? You can actually see several designs if you look at different angles. It looks modern and farmhouse-y without looking busy. After the paint was dry (overnight just to be sure). I applied at least 3 coats of polyurethane to seal the print. Let it dry at least 4 hours between coats. This may even contradict what the instructions on the can say. Just trust me on this one. If you follow my suggestion above and print your tiles after they are installed, once the tiles are sealed your work is ready to be admired by all! The best part is: if you get bored with the design you can scrape it all off with hot water and some scrubbing and you can do a whole new print! This can also work if you rent and you hate the look of the current tiles but don’t want a permanent change. It has been about 7 months I did this project and I can say that it’s holding up pretty well. I had some very minor peels but only because they were flimsy in the first place (Remember I told you about not doing the stamping before tiling and grouting? Yep, I didn’t do that and that’s the only reason I had some peels). 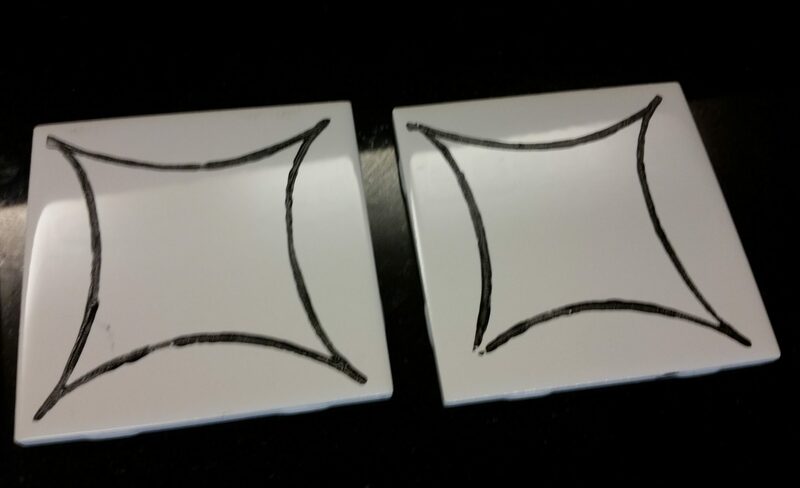 If anything peels you can always do minor corrections with a brush and reseal the tile. No Biggie. Just make sure that when you clean the tiles you don’t use any scrubbing sponges or harsh chemicals. Basically, soap and water. Even if you fry stuff near the wall, somehow the sealer prevents the grease from sticking to it and it does make it easy to clean just by wiping. I hope you enjoyed this project. Follow us on Facebook for new updates and cool projects. We are also on Pinterest. Oh, if you sign up for our email list below, you will receive a few ready to go designs you can use to make your own faux cement tile backsplash! Simply print the design, make your stamp, and start printing! I would love to see how your design turned out! Sign up and Receive your Tile Design Ideas Today! We will keep you posted with updates and more DIY Projects on a Budget right in your inbox. Yes! I want my Tile Designs! Thank you! Glad to hear! oh my goodness! I absolutely love this! Thank you, glad you like it! I love finding ways to save and still have a pretty home one project at a time.